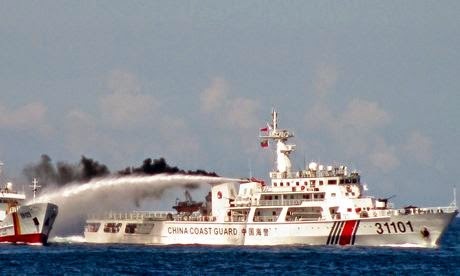 Last week, I described a far reaching major strategic move by China in my blogpost “ China stations an oil rig in a disputed part of South China Sea.” I had also mentioned there, that a meeting of the ASEAN countries was due on the week-end in Myanmar. That meeting was held on schedule, but instead of any rock like support to a fellow ASEAN country, most of the member countries just paid lip sympathy and tried to generalize things by asking for a wider binding treaty for South China Sea nations. China is not expected to pay any heed to ASEAN for the simple reason that compared to its military might, ASEAN countries do not stand any chance. "We are deeply concerned by Chinese assertiveness in the South China sea. The Chinese navy is acting without provocation. These decisions seem to be taken by the Chinese leadership at the highest level," Then he added: “There was not much clarity in the Obama administration. That is why we want India should rise quickly. We have great expectations from India,"
"I wish to tell the Indian people that they may not worry too much about the current situation in South China Sea," Chinese foreign ministry spokeswoman Hua Chunying said on Monday. "The facts prove that Vietnam is trying to rope in other parties and put pressure on China, (but) will not achieve its aims,"
India, however can do precisely little at this point of time. General elections have been just finished in India, with results due by week end. The new Government would need time to settle in. Until such time, India is unlikely to react. India is playing safe now and has called for freedom of navigation in the sea without naming China or Vietnam. India's external affairs ministry says: “We are concerned about the recent developments in the South China Sea and We would like to see resolution of the issue through peaceful means in accordance with universally recognized principles of international law." 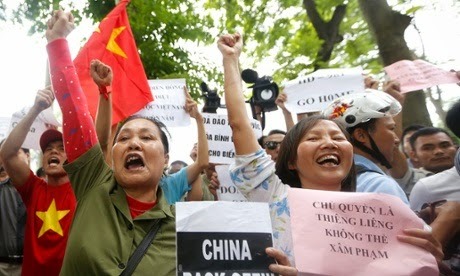 In Vietnam, demonstrations were held at the Chinese embassy in Hanoi and protests elsewhere in Vietnam. Bloomberg reports that About 1,000 people marched in Ho Chi Minh City streets on Sunday while hundreds gathered in a public square in front of the Chinese embassy in the capital city of Hanoi as police officers watched without interrupting. Coming back to the ASEAN summit, Vietnam's prime minister accused China of brazenly triggering a tense maritime standoff in contested South China Sea waters. He asked fellow Southeast Asian leaders to join his objections to China's attempt to place an oil rig in waters claimed by both Beijing and Hanoi and described the move as a dangerous violation of international law and a serious threat to security in one of the world's most important sea lanes. He also warned the ASEAN nations about Beijing's growing assertiveness in its territorial claims. Vietnam however could not get support it hoped from ASEAN even though Chinese have been claiming huge areas of the coasts of Borneo, Brunei, Malaysia, Indonesia and the Philippines. ASEAN foreign ministers on Saturday jointly only expressed "serious concerns" over the latest confrontation and were not agreeable to directly criticize Beijing, and reiterated calls for restraint and greater urgency in multilateral talks on a code of conduct in the South China Sea. It is obvious that they do not want to do anything except for some face saving measures. Only country that strongly supported Vietnam was the Philippines because it is facing similar situation. 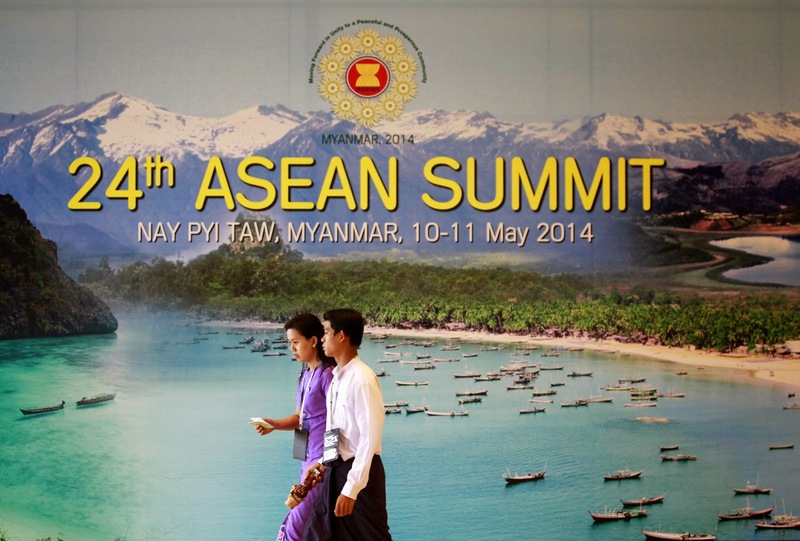 Other ASEAN members are obviously reluctant to take a stronger stance against China. Countries such as Singapore and Thailand, which have no claims in the South China Sea, managed taking no sides in the dispute and just urged restraint from all parties involved. It is obvious that considering Chinese size, trade potential and also its military strength, Vietnam may not find many supporters and would have to their own thing, if they want to retain their territorial claims. As a result of similar standoff against China the Philippines have now approached for international arbitration. Whether the Chinese ships would go back or stay put, depends upon what level the decision has been taken. If it has been taken by some lower level officials, just to test international and US response, the ships might back off. However if the decision has been taken at the top, Chinese ships would stay put. In that case, Vietnam has a real problem on hand. It can no longer depend on ASEAN countries, who have shown that they are weak at the knees as far as China is concerned and would have to do its own thing.